Population losses in Puerto Rico have accelerated in recent years, affecting every corner of the island and continuing the largest outmigration in more than 50 years, according to a Pew Research Center analysis of newly released county-level Census Bureau data. Among Puerto Rico’s counties that saw the largest population losses between 2010 and 2015 was San Juan, home to the island’s capital city and largest metro area. That county’s population declined by 40,000 people (-10%) to 355,000, by far the largest numeric drop of any county. 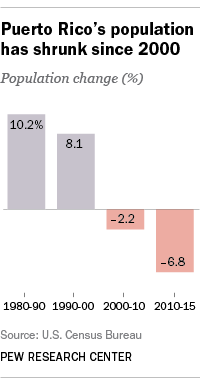 Nine other counties saw population declines of at least 10% during this time. Only one of the island’s counties, or municipios, saw a significant population increase between 2010 and 2015: Gurabo, in eastern Puerto Rico, grew by 1,900 people (4%) to 47,000. Overall, the island’s population was an estimated 3.47 million in 2015, down 334,000 from 2000 – a 9% decline. Three-quarters of this population loss has taken place since 2010. Puerto Rico’s population declined by 7% from 2010 to 2015, compared with a 2% loss from 2000 to 2010. Population growth was once the norm in Puerto Rico. The island’s population grew by 10% from 1980 to 1990, and by 8% from 1990 to 2000. But as the effects of a decade-long economic recession have mounted, Puerto Ricans – who are U.S. citizens at birth – have increasingly moved to the U.S. mainland, with many settling in Florida. In addition, fertility on the island has declined in recent years, adding to population loss. Economic opportunity is one of the primary drivers for moving to the U.S. mainland, according to Census Bureau data. Among island-born Puerto Ricans who moved to the mainland, 40% said they left mainly for job-related reasons, while 39% cited family-related reasons. The island’s sustained outmigration and low fertility rates have helped push its population below 1990 levels, when 3.52 million people lived on the island. For now, the island remains above its 1980 population of 3.2 million. However, the Census Bureau projects the population of Puerto Rico will fall to 2.98 million by 2050.